Schinoussa is a pretty and quite little island of 8.14 km², lying south of Naxos and NE of Iraklia. Although its tourism sector has grown appreciably thanks to an improvement in infrastructure in the last 20 years, it is still on a low enough key not to affect the traditional character of the island. Quiet and tranquility are the most lasting impressions on a visitor’s memory. 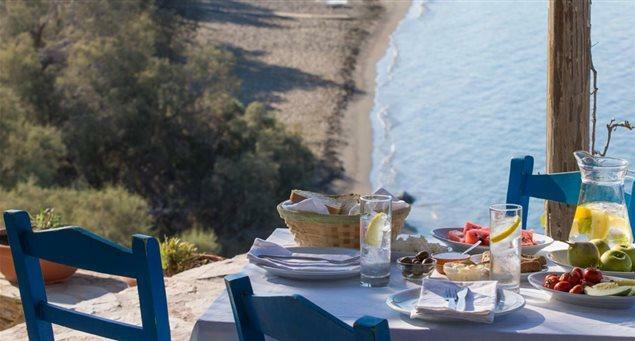 Τhe main cove, Merssini, is considered one of the best small boat shelters in the entire Cycladic region. Aside from tourism, the other main sources of income for the approximately 250 permanent inhabitants are farming and livestock breeding. Also, the setting up of a secondary education school on the island seems to have reversed a population decline. There are two main settlements, Panagia, or Schinoussa, where most people live –roughly in the center of the island and 1.2km from the port, Merssini- and Messaria, in the north. Merssini is a hamlet with a few houses, tavernas and rooms to let. The island has a well-equipped clinic and helipad. There is a daily boat connection with Naxos and the other islands in the group of the Small Cyclades. Transportation on the island is by car, on foot. Tours by boat around the island and excursions to nearby islands is available.